PASADENA, TEXAS (November 24, 2010) It is being reported by ESPN.com and the Lubbock Avalanche-Journal that former Texas Tech head football coach Mike Leach is suing ESPN for deformation of character, slander and libel. Leach was fired last December after allegations were made, accusing him of mistreatment of running back Adam James. Leach filed a lawsuit on Wednesday alleging that he was defamed by ESPN and college football analyst Craig James, who is also the father of the younger James. The suit, which was filled in Texas district court, claims ESPN failed to "retract false and damaging statements" made from "misinformation" James provided. The suit also names Spaeth Communications as a co-defendant, claiming the elder James hired the firm for "purposes of creating public opinion hostile to Leach." Leach is now working as an announcer for CBS College Sports, while the elder James is currently working as a sports commentator for games on ABC and ESPN television. The younger James is in his junior year at Texas Tech, playing inside receiver. He has played in a total of eight games this season, catching two passes for 16 yards. HOUSTON, TEXAS (November 23, 2010) Trailing by 12 points at the half, the Houston Cougars (4-1, 0-0 C-USA) mounted a solid offense, coming from behind to beat the Louisiana Ragin’ Cajuns (1-4, 0-0 Sun Belt) 78-65 at Hofheinz Pavilion. Offensive rebounds and consistent shooting seemed to be the problem for the Cougars early in the game, shooting 38% from the floor while pulling down only two offensive rebounds. Cougar guard Adam Brown had his best game of the young season, scoring 23 points and pulling down five rebounds on 37 minutes of playing time. Kirk Van Slyke and Kendrick Washington each scored 17 in the effort. The Ragin’ Cajuns lead 38-26 at the half, but the Cougars went on a scoring run the second half, outscoring their opponent 52-27. They did pull down 34 defensive rebounds, but when a team does not hit the boards, they are going to get caught up in a battle that, in most cases, they cannot win. The Ragin’ Cajuns started off with a solid effort, but fell apart late in the second quarter. Houston took the lead 67-65 at the 3:07 mark of the 2nd quarter on a three point shot by Adam Brown. The Cougars and never looked back, scoring 11 unanswered points for the win. The Ragin’ Cajuns were led by Josh brown with 16 points, while La’Ryan Gary added 13. The Cougars will now hit the road for three games, beginning Nov. 27 at TCU, followed by games on Nov. 30 at LSU and Dec. 4 at Sam Houston State. HOUSTON, TEXAS (November 20, 2010) The Houston Cougars jumped out to a 17 point lead at halftime in route to a 81-58 win over the Northwestern Oklahoma State Rangers at Hofheinz Pavilion. The Cougars had a balanced game with 11 players getting playing minutes with nine scoring points. Maurice McNeil led the Cougars with 16 points and 10 rebounds. Darian Thibodeaux chipped in 15 while Kendrick Washington came off the bench to score 13. Kirk Van Slyke added 11 points with five rebounds in the win. Zamal Nixon continued his solid all-around play, scoring 10 points with a game-high eight assists, five rebounds and two steals. The Rangers led early in the game, 7-4 with 17 minutes left in the half. Houston tied it up at the 16:10 mark on a 3-pointer by Van Slyke. From that point on, it was Houston’s game. Houston scored 24 of 31 field goals in the first half but could manage only 16 of 39 in the second. Head coach James Dickey emptied his bench midway through the second half to give some much needed playing time to all his players while the season is still young. While leading the Cougars to the win, McNeil got his third double-double (16 points, 10 rebounds) of the season. With the win, the Cougars improved to 3-1 overall, while the Rangers dropped to 4-1. (HOUSTON, TEXAS) The University of Houston men’s basketball team returns home to Hofheinz Pavilion this weekend to start a brief two-game homestand. The Cougars play host to Northwestern Oklahoma State at 2 p.m., Saturday before meeting Louisiana-Lafayette at 7 p.m., Tuesday. Earlier this season, the Cougars opened their schedule with back-to-back home wins against Nicholls State and Alcorn State. The Cougars (2-1) enter this weekend’s game on the heels of a 60-54 loss at Louisiana Tech on Wednesday, snapping Houston’s two-game winning streak. Against the Bulldogs, senior forward Maurice McNeil posted 11 points and nine rebounds, falling just oneboard shy of his third straight double-double to begin the season. Junior guard Darian Thibodeaux added 11 points with three rebounds and two assists, while senior guard Zamal Nixon added seven points, two rebounds, four assists and a steal. Senior guard Adam Brown leads the Cougars with 17.3 points per game with a team-high five rebounds, while McNeil ranks second on the team with 14.0 points and a team-high 11.3 rebounds percontest. WEST PLAINS, MUSSOURI) With a straight-set win over Western Wyoming College Friday night, the San Jacinto College volleyball team advances to the championship match of the National Junior College Athletic Association (NJCAA) volleyball tournament. Third seed San Jac defeated No. 2 Western Wyoming College 25-21, 25-21, 25-21 to advance to the national title match against Western Nebraska Community College (WNCC). Fourth-ranked WNCC defeated No. 8 Salt Lake City Community College in four sets to advance to Saturday’s championship game. With the win, SJC moves to 29-9 overall on the season. San Jac last won the volleyball national title in 1987. The highest national finish under Head Coach Sharon Nelson is fifth, in 2008. San Jac is led by sophomore Alyssa Dibbern (Bay City / Bay City HS) who ranks 19th in the nation with 404 kills. She was named the Region XIV player of the year, and is a first-team all-conference selection. Dibbern also leads the team in blocks with 116 total. Leading the offense is first-year setter Chelsey Harding (Houston / Cypress Springs HS). She ranks in the top 25 in assists per set with an 8.48 average. HOUSTON, TEXAS (November 14, 2010)The Houston Cougars improved their season record to 2-0 Sunday afternoon after downing Alcorn State Braves 88-68 in men’s basketball action at Houston’s Hofheinz Pavilion. Tied at 35 after the first half, the Cougars exploded with 43 points in the second half to clinch the win and take their season record to 2-0. With the score tied 42-42 at 17:44 mark in the second quarter, the Cougars ran off 19 points during an eight minute stretch and built a lead of which they would never relinquish. McNeil scored 19 points with 12 rebounds while Brown tallied 23 points. Houston converted 19 of 29 (65.5 percent) of its second half shots while limiting the Braves to only 34.4 percent from the field during the final 20 minutes. Alcorn State was led by Marquiz Baker with 23 points and Kendrick McDonald with 17 points. With the loss, Alcorn State drops to 0-2 on the season. Houston will now hit the road for their first road game of the season. Houston meets Louisiana Tech in Ruston, La., at 7:00 pm this coming Wednesday. From there, the team returns to the friendly confines of Hofheinz Pavilion to play host to Northwestern Oklahoma State at 2 pm on Saturday. PASADENA, TEXAS (November 14, 2010) As the third-ranked San Jacinto College volleyball team prepares for it’s sixth-straight trip to the National Junior College Athletic Association (NJCAA) national tournament, six players have been named to the All-Region XIV conference team, as voted by the league coaches. In addition, San Jac nabbed the player, setter, newcomer, and coach of the year honors. Sophomores Alyssa Dibbern (Bay City / Bay City HS), Candace Soares (Mililani Hawaii / Mililani HS), and Brittany Weiler (Deer Park / Deer Park HS), and freshman Chelsey Harding (Houston / Cypress Springs HS) earned a spot on the Region XIV first team, while sophomores Amanda Deem (Pearland / Pearland HS) and Lauren Curley (Corona, Calif. / Corona HS) were named to the second team. In addition to earning first-team honors, Dibbern is also the league’s player of the year. She led the squad in kills per set at 3.51, a mark that is also 19th in the nation. She was a two-time conference player of the week selection this season, helping San Jac to a perfect 10-0 conference record. She also averages over one block per set. Dibbern was last year’s Region XIV freshman and offensive player of the year. Soares finished the regular season second on the team in kills per set with a 3.41 average, good for 23rd in the nation. She was also one of San Jac’s top defenders, hitting the court for 3.87 digs per set, second on the team behind the libero, Deem. Soares earned NJCAA player of the week honors for the week of Sept. 6, 2010. Weiler was named the league’s newcomer of the year. 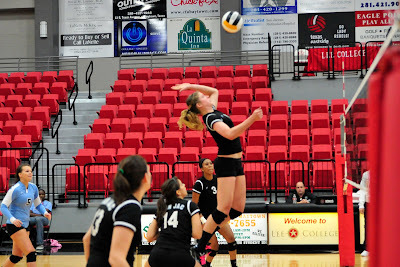 She transferred from Lamar University and split time at setter and libero. Her 3.01 assists per set was second on the team and she averaged 3.68 digs per set. She was twice selected as the conference player of the week this season – once as setter, and once as libero. Harding led the San Jac offense, averaging 8.48 assists per set (24th in the nation), and was rewarded as the conference setter of the year. She was a conference setter of the week selection for the week of Sept. 27, 2010. Deem led the team in digs, having started at libero most of the season. Her 6.06 digs per set is seventh in the nation. 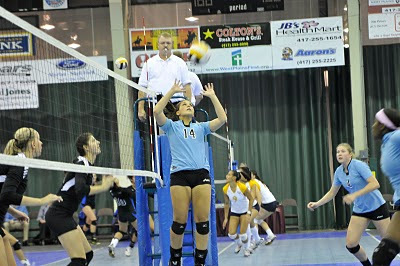 She was the conference libero of the week for the week of Oct. 25, 2010. Curley averaged 1.61 kills per set and just under one block per set for San Jac this season. She was a league player of the week for the week of Sept. 27, 2010. Nelson owns an overall record of 261-95 (.733) in nine seasons at San Jacinto College. San Jac finished the regular season with a 26-9 overall record, and is returning to the national championship for the sixth-straight year. The NJCAA national championship is Nov. 18-20 in West Plains, Mo. PEORIA, ILLINOIS (November 14, 2010) Three Aeros collected multiple points, including defenseman Maxim Noreau who had a goal and two assists, and the Houston Aeros scored five times in the second period en route to a 5-2 win over the Peoria Rivermen Sunday at Carver Arena. Carson McMillan and Jared Spurgeon each added a goal and an assist and Matt Hackett made 21 saves for his first win since Oct. 15 and third overall this season. After a scoreless first period, Houston’s Petr Kalus scored 28 seconds into the second for his fourth goal of the season. Peoria’s Derek Nesbitt responded 52 seconds later to knot the score at 1-1. Ian Cole gave the Rivermen a 2-1 lead just 1:17 later. Houston began a run of four unanswered goals starting with Spurgeon’s first as a pro, on the power play, at 4:50. Noreau scored the eventual game-winner at 10:36 and then Joel Broda tallied with another power play marker at 13:55. McMillan added a shorthanded goal, the team's first this season, at 15:13. The Aeros went-2-for-7 on the power play and have scored on the man-advantage in six of their last seven outings. Peoria goalie Jake Allen (17 saves) suffered the loss, his first as a pro, and was relieved after Houston’s fourth goal. Ben Bishop made eight stops in 23:46 of mop-up duty. HOUSTON, TEXAS (November 14, 2010) The Houston Cougars (5-5, 4-3 C-USA) could not catch a break on Saturday night as they dropped their next-to-last conference game of the season 28-25 to the Tulsa Golden Hurricane (7-3, 4-2 C-USA). I guess “catch a break” may not be the right phrase. When you give up 413 yards and 28 points on defense, you should not expect anyone to give you a break. Defense, or a lack of it on Houston’s part, was the determining factor in the game. Many have said it in the past and continue to say it to this day. A team cannot win game after game by trying to simply outscore their opponents. Defense must be a key to their game plan. Before Case Keenum went down in the UCLA game, Houston could usually muscle enough yards and points on offense to win. That cannot be and is not the plan that needs to be followed when a team has experienced the setbacks the Cougars have in 2010. If Cotton Turner had not also again down in the UCLA game, would Houston have won a few more games this season? Possibly! No one can really know for certain. What I do know is that freshman quarterback David Piland has done a remarkable job so far this season, only being six months out of high school. Defense is where the Cougars are lacking and when this season is over and done, Cougar fans will have their own opinions of what went wrong. Head Coach Kevin Sumlin and his staff will come up with their own ideas of what went wrong and will set out to fix it for the 2011 season. But no matter what any of the fans or naysayers postulate, a sub-par defense was the reason for Houston’s fall from grace. Defense is needed in every football game, no matter what level. The one team that lives by that rule is the Pittsburgh Steelers. The Steel Curtain defense, along with a potent offense attack propelled Pittsburgh to six Super Bowl titles. They would not have been so successful with a lack of skill on either side of the line. The Cougars have that skill (at their playing level) on the offensive side of the ball. However they are serious lacking on the defensive side. Houston needs to shore up their defensive line and deep secondary in their recruiting for 2011. They have the offensive punch to score touchdowns but they must, and I repeat that word, MUST focus on their defense if they want to return to the success of the past years and possibly move to the next level of college football. Next Saturday, the Cougars will play Mississippi State in Hattiesburg, Mississippi. It will be their final Conference USA of the 2010 season. A win would give them a 6-5 record going into their last regular season game against Texas Tech on Nov. 27. The Cougars need six wins to become bowl eligible. With the loss to Tulsa, the Cougars may have virtually eliminated themselves from the bowl picture. Yes, with wins over Mississippi State and Texas Tech, they would have a chance to be selected to a bowl game. The question is “Who wants to invite a team to a bowl game if they played like the Cougars did this season? The honest truth is that no I or anyone else I know can answer that question. The bowls election committees will make that determination. I would like to see the Cougars in their sixth straight bowl game. The fans would also like to see it. The players and coaches would love to experience it. The sad thing is I just do not see it happening. Either way, the Cougars will be back in 2011, with our without Case Keenum at quarterback. That story (Case Keenum’s appeal for a 6th year of college football) will be the basis of a story in the near future. HOUSTON, TEXAS (November 13, 2010) There will be no rest for the weary as the University of Houston men’s basketball team returns to action at 2 p.m., Sunday, when it plays host to Alcorn State inside Hofheinz Pavilion. Sunday’s game will be part of a doubleheader with the Houston women’s basketball team, which faces UT Arlington at 5 p.m. The Cougars enter Sunday’s game on the heels of a thrilling 63-62 overtime win against Nicholls State. Senior forward Maurice McNeil hit a scoop shot with three seconds remaining to give the Cougars the come-from-behind victory. In a game that featured long runs by both squads, the Cougars enjoyed their sixth season-opening win in the last seven years. With the Cougars trailing 34-24 early in the second half, senior guard Adam Brown almost single-handedly brought the Cougars back from the brink. The San Antonio, Texas, native scored 11 consecutive points, hitting four straight field-goal attempts, and added a rebound and steal in a 6:28 stretch that saw the Cougars score 15 unanswered points and take a 39-34 lead. Brown led the Cougars with 20points on 6-of-9 shooting for the fourth 20-point game of his career. McNeil finished with 12 points and a game-high 13 rebounds for the seventh double-double of his career. Sophomore forward Kirk Van Slyke added 12 points and a career-high 10 rebounds for the first double-double of his career. Alcorn State enters this weekend’s game on the heels of an 88-56 loss at Texas A&M on Friday. The Braves fell behind 52-25 at halftime and connected on only 17-of-57 (29.8 percent) from the field. In addition, Texas A&M outrebounded Alcorn State 52-32 and forced 19 turnovers. Chris Davenport came off the bench to lead the Braves with 11 points and five rebounds. Tony Eackles added nine points and four rebounds, while Kendrick McDonald finished with eight points, two rebounds, three assists and a pair of steals. Head coach Larry Smith is in his third year at Alcorn State, posting an 8-55 (.127) record during that time. Houston owns a 3-0 lead in the all-time series, which began March 11, 1982, during the NCAA Tournament Midwest Region First Round in Tulsa, Okla. The Cougars are 2-0 against Alcorn State in Houston, and those games have not been close. Houston has scored at least 110 points and won by an average of 40.5 points per game in those home contests. Sunday’s game will be the first time that head coach James Dickey has faced Alcorn State. HOUSTON, TEXAS (November 12, 2010) Senior forward Maurice McNeil's scoop shot off the glass with three seconds remaining in overtime lifted the University of Houston men's basketball team to a 63-62 against Nicholls State inside Hofheinz Pavilion on Friday evening. With the Cougars leading 61-59 following McNeil's free throw with 1:26 remaining in the extra period, Nicholls State forward Anatoly Bose was fouled while attempting a 3-pointer with just 26 seconds left. The Sydney, Australia, native hit all three attempts to give the Colonels a 62-61 advantage. On the ensuing possession, Houston junior guard Darian Thibodeaux's baseline 3-pointer was off the mark, but Nicholls State's Bryan Hammond's was whistled for traveling after falling to the floor on the rebound. Following a Cougar timeout, McNeil stepped out to take the inbounds pass and worked his way into the paint before banking a short shot off the glass. "When we had a timeout at the end of the game, I told our guys we were going to score," said head coach James Dickey, who made his Cougar debut. "It's not the way we drew the play up, but that's what you expect from your seniors, to make the tough, smart plays down the stretch." The Colonels had one last chance, but Bose's 3-pointer at the buzzer was off the mark. In regulation, sophomore forward Kirk Van Slyke gave the Cougars a 51-50 lead with 1:25 to go on a 3-pointer from the top of the key. With 46 seconds left in the second half, NSU forward Fred Hunter converted an old-fashioned 3-point play to give the Colonels a 53-51 lead. Houston junior guard Adam Brown was fouled with 25 seconds left, and the San Antonio, Texas, native calmly drilled both attempts to knot the game at 53-53. Working the clock down, Bose missed a potential game-winning 3-pointer with four seconds left to send the contest into overtime. Friday's season opener was a game full of runs by both teams. After the Colonels scored the first five points to open the second half and build a 34-24 lead, Brown single-handedly pulled the Cougars back into the game with 11 straight points. McNeil added a pair of free throws, and Brown capped the 15-0 run with two more free throws for a 39-34 Houston lead with 11:42 remaining in regulation. When the Colonels responded with a 9-0 run of their own to take a 43-39 lead, the Cougars answered with a 5-0 run to reclaim a 44-43 lead. Nicholls State responded with a 7-0 rally to build a 50-44 lead, but the Cougars scored seven straight points and grabbed a 51-50 lead on Van Slyke's trey. After being held scoreless through the first 20 minutes, Brown posted 20 second-half points to lead the Cougars. It was the fourth 20-point game of his career. McNeil posted 12 points and a game-high 13 rebounds for the seventh double-double of his career, while Van Slyke recorded 12 points and 10 rebounds for the first double-double of his career. Hunter led all players with 28 points on 12-of-21 shooting and added eight rebounds. Bose posted 22 points but was limited to 1-of-9 shooting from the arc. No other Nicholls State player scored more than four points in the loss. HOUSTON, TEXAS (November 12, 2010) The Houston Cougars (5-4, 4-2 C-USA) will celebrate its 65th Homecoming this Saturday as they take on the Tulsa Golden Hurricane (6-3, 3-2 C-USA) at Houston’s Robertson Stadium. This weekend’s contest will be the 26th meeting between Tulsa and Houston and the Cougars lead the series, 19-16. The two teams first met on December 2, 1950 at Rice Stadium with the Golden Hurricane coming out on top 28-21. Last year’s game at Tulsa was an exciting come-from-behind 46-45 victory for the Cougars. Case Keenum hit back-to-back passes to put Houston in field-goal range and then-redshirt freshman Matt Hogan kicked a 51-yard field goal as time expired to lift the Cougars to a 46-45 victory against Tulsa. After getting sacked on a potential tying 2-point conversion with 21 seconds left, Keenum bounced back to complete a 14-yard pass to junior James Cleveland and a 13-yarder to sophomore Tyron Car¬rier to set up Hogan’s kick with just three seconds left. Down 10 points, Keenum led the team on a 61-yard scoring drive with a 1-yard pass to Cleveland to get the Cougars within two before missing the 2-point conversion. This weekend’s game marks the 65th Homecoming in school history. The first Homecoming game for UH was also in its first year of the football program, a 3-7 loss to North Texas. The Cougars are 32-27-5 in Homecoming games and are 5-1 vs. Tulsa at Homecoming. Houston head coach Kevin Sumlin is 2-0 vs. Tulsa. Houston is 4-1 since Tulsa joined the league in 2005. The game will be carried on national television by CBS College Sports. It can also can be heard locally in Houston on 790-AM KMBE. BAYTOWN, TEXAS (November 6, 2010) For the sixth-straight year, San Jacinto College has won the Region XIV volleyball title, earning a sixth-consecutive trip to the National Junior College Athletic Association (NJCAA) national tournament. San Jac defeated Laredo Community College 3-1 (22-25, 25-22, 25-10, 25-22) Saturday afternoon for the Region conference championship. Sophomores Candace Soares (Mililani, Haw. / Mililani HS) and Alyssa Dibbern (Bay City / Bay City HS), along with freshman Jazmine Green (Houston / Cy Falls HS), were named to the all-tournament team. San Jac finishes the 2010 season ranked third in the nation with an overall record of 26-9. 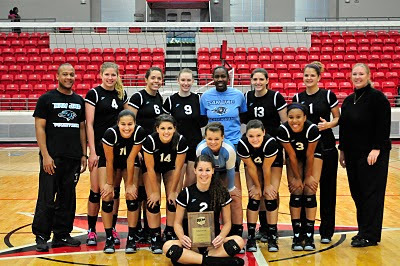 The NJCAA national tournament will take place November 18-20 in West Plains, Mo. HOUSTON, TEXAS (November 5, 2010) With their 40-27 loss to the University of Central Florida Knights this evening, the Houston Cougars are in a must-win situation the rest of the season in order to keep their chances alive to play in their sixth consecutive post season bowl game. With the loss to UCF, the Cougars dropped to 5-4 for the season and 4-2 in Conference USA play. The Cougars will face C-USA opponents Tulsa (Nov. 13) and Southern Mississippi (Nov. 20) before taking non-conference foe Texas Tech in their last regular season game on Nov. 29 in Lubbock. Tulsa (5-3, 2-2 C-USA) will play Rice (2-6, 1-3 C-USA) at home on Nov. 6. The game should be a cakewalk for the Golden Hurricanes, but that is what Houston thought before being snaked by Rice 34-31 on Oct. 16. This game could go either way, but I expect a Tulsa victory. They have outscored their opponents 297-229 while Rice has only scored 178 points while allowing opponents to rack up 283 points this season. That would make Tulsa 6-3 for the season when they face the Cougars. With the lack of consistency shown by the Cougars this season, the game could be a win for Tulsa. Houston head coach Kevin Sumlin will have to use all of his offensive skills and find a way to motivate the defense to stop the Golden Hurricanes. Southern Mississippi (5-3, 2-2 C-USA) is currently in third place in C-USA East and will square off against Tulane (3-5, 1-3 C-USA) on Nov. 6 in New Orleans. That should be a sure win for the Golden Eagles, giving them needed momentum going into their game with UCF on Nov. 13. It will not matter if Southern Mississippi wins or loses against UCF. They will be facing Houston in Hattiesburg and the Cougars have had trouble playing on the road this season. They have a 1-2 record when away from Robertson Stadium this season, losing to UCLA 31-13 on Sept. 18, Mississippi State 47-24 on Oct. 9, and cross-town rival Rice 34-31 on Oct. 16. If the Cougars win either of their next two games, they will be bowl eligible with at least six wins. The Texas Tech game may simply be an afterthought as far as the bowl officials are concerned. Conference USA is guaranteed spots in six bowl games and will serves as a primary back-up for a possible seventh game. The fact remains is which bowl, would select the Cougars if they finish with 6 conference wins. In my mind, the Cougars must win their remaining three games if they hope to gain admittance to bowl play. By winning their three remaining games, they will finish the regular season with an 8-4 record going into the C-USA championship game on Dec. 4. At that point, win or lose, they would be headed to a bowl. The key point is that they must win their remaining three games in order to be guaranteed a chance at post-season play. If not, the only bowl game the Cougars will be watching in December will be on their television sets. HOUSTON, TEXAS (November 5, 2010) The University of Central Florida Knights are showing the Houston Cougars what a potent running game can accomplish as they take a 23-10 lead to the locker room at halftime . The Knights have racked up a total of 328 yards on offense while holding the Cougars to 224 yards. The Cougar defense has been unable to stop UCF quarterback Jeff Godfrey who has a combined 251 yards of offense while throwing for two touchdowns. The true freshman quarterback will undoubtedly raise his rating after this game after completing 11 of 14 passes with no interceptions with 30 minutes yet to play. Houston quarterback David Piland has completed 10 of 17 in the air for 100 yards and one interception. UCF scored touchdowns on a Bruce Miller interception return, two pass receptions to Ricky Kay and A.J. Guyton and a Nick Cattoi field goal. Houston got on the scoreboard on a 30-yard Matt Hogan field goal and a 33-yard pass reception to Patrick Edwards. In the second half, the Cougars must find a way to gain more yardage against a stingy Knight defense and to contain the Knight’s rushing game. I will have more highlights after the game. HOUSTON, TEXAS (November 5, 2010) The Houston Cougars will try to improve on their 4-1 conference record University of Central Florida Knights on a rare Friday evening game at Robertson Stadium in Houston. The Cougars, who are 5-3 on the season, will be facing a tough UCF Knights team that is 6-2 for the season while posting a 4-0 conference record. The teams have faced each other on three previous occasions, with the Knights leading the series 2-1. In last year’s game, the Knights beat the Cougars 37-32 in Orlando. This year’s game takes on an additional significance as the Cougars lead the C-USA West standings while UCF lead the East. The Cougars will be led by true freshman quarterback David Piland and junior running back Bryce Beall. Beall broke the school career record for rushing touchdowns with 32, topping Jackie Battle’s 31 scored from 2003-06. He also has 12 rushing touchdowns for the season which is three away from the school single-season record of 15. The Knights are also led by a true freshman. Jeff Godfrey owns a 137.77 passer efficiency rating , which is the highest in the nation among all true freshman quarterbacks. Houston’s Piland carries a 137.18 rating. The Cougars defense will have to find a way to stop the highly efficient Knight offense which has scored at least 35 points in each of their last four games and surrounded an average of 391 yards a game. The Knights excel in their ground game, and if the Cougars are going to stop the Knight’s rushing game, they must improve on giving up an average of 194 yards on the ground to their opponents. The game could also determine who gets home field advantage for the C-USA Championship Game on December 4. The Cougars-Knights game is set for a 7:00pm kickoff in Houston and will be televised on ESPN2.